Back in the 1970s, flexible sheet, for a variety of uses, was either EPDM or flexible PVC. EPDM was not weldable and flexible PVC contained liquid plasticizers. Those plasticizers led to hazing of automotive windshields and embrittlement of the PVC as they evaporated. Thermoplastic polyolefins (TPO) were developed to be inherently flexible, plasticizer and halogen free, and to heat-weld. TPO membranes were first used for geomembrane applications such as pond liners. They also began to appear in the automobile industry to protect exterior surfaces and to be used as wire covers. 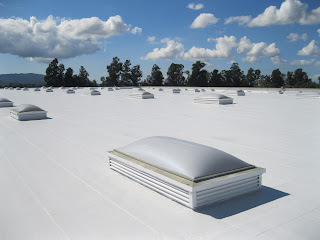 The first known TPO roofing membrane was installed in 1986 in Michigan. The TPO was produced by Montell specifically for the roofing market. Montell merged with two other companies in 2000 to become Basell. That company merged in 2007 with Lyondell to become Lyondell-Basell, which still supplies the majority of TPO to the roofing industry. In the late 1980s, Versico, a division of Goodyear Tire and Rubber, started to promote VersiWeld®, a reinforced TPO roofing membrane. They were followed by JPS Elastomerics in the early 1990s which launched Hi Tuff EP. JPS eventually became Stevens Roofing Systems. In the early 1990s, concerns began to surface about the use of halogenated fire retardants in TPO and their effect on UV resistance. This caused manufacturers to alter their formulations, using magnesium hydroxide as the fire retardant. This remains the case today. In the mid-1990s, Carlisle Syntec Systems acquired Versico and began marketing a TPO roofing membrane named SureWeld. Beginning in the late 1990s, TPO began to gain significant market share. The specification covers physical properties, dimensions, and durability properties. The latter includes ozone resistance, heat aging, and weather resistance. Oven aging was tested at 240°F and went for 28 days. The ultraviolet light resistance is tested using a xenon arc apparatus and the exposure was doubled in 2006 to 10,080 kJ/m2. In 2011, the ASTM standard was revised again to address the heat aging protocol. This was raised to 240°F exposure for 224 days or 32 weeks, from 28 days. From 1998 to now, TPO membrane sales have grown annually at a double-digit rate, far outpacing any other single-ply, mod bit, BUR, or metal product and its popularity as a commercial roofing material has spread worldwide.